Flexi Business Loans: A Smart way to Manage Your Business! Are you a business owner who is facing shortage of funds? If yes, you will be getting a perfect solution to meet your capital requirements after scrolling through this blog. As a business owner, you may require funds to purchase raw material, stock inventory, pay wages, marketing, hire new employees, etc. While there are plenty of funding options available, a business loan seems to be the best option to manage your finances well. However, to get a normal business loan approved and disbursed it takes a long time. This is when these new age loans known as Flexi Business Loans come to your rescue. Loans are an integral component of any business, may it be buying inventory, paying your staff or incurring the normal business costs. But, lots of paperwork and lengthy loan procedures usually scare us away. However, there’s nothing to get worried about when you have faster ways and a useful variant of loans called Flexi Business Loans. Flexi Business Loans are a fresh and an innovative way of borrowing funds wherein you have access to easy loans based on your credit ratings. You get a pre-approved loan limit that helps you borrow money whenever you need it. The best and the most important part is that there is no need to apply through multiple applications whenever you want additional capital. This indeed sounds to be a simple and quick method to enjoy instant business loans. You can withdraw money easily from your loan account as per your requirements and pay it back when you have sufficient funds. Moreover, the entire loan disbursal system has been simplified by companies like Bajaj Finserv that offer you a customer friendly online portal for a great and a hassle free experience. “Borrow when you want, repay when you can” is the primary basis for a flexi business loan. Flexi business loans offer high loan amounts up to Rs. 30 lakhs. Flexi interest-only loan variant allows you to pay only the interest as EMI and the principal at the end of the tenor. This helps you have significantly lower EMIs. Interest is charged only the amount utilised and not the entire approved loan limit. For example, if you utilise only 7 lakh from the approved loan limit of 20 lakh, then interest will be charged on Rs.7 lakh and the entire approved limit of 20 lakh. This further brings down your EMIs. Faster loan processing with money in bank in 24 hours to address immediate financial needs. Enjoy low interest rates, that’s what we normally look for while getting any kind of loan. Borrow the desired amount when you require it for business transactions. Part-prepayment of loan is allowed that too without any additional cost. Multiple withdrawal facility without any extra charges is also an added advantage. You may also like: How to get Collateral Free Business Loans easily? Previous year’s turnover duly audited by a CA. Once your documentation and KYC is complete, there’s just an effortless process to follow. Few easy steps and you are done with it! Be ready to get a fairly good amount of business loan credited to your loan account. Meet your regular business costs, clear your bills, enhance your work or improve your overall services through a flexi loan. ALSO READ Demonetisation : Rs.500 and Rs.1000 old currency notes abolished in India ! No matter you are a self-employed professional or non-professional, running a partnership firm or a company, flexi business loans are there to cater to all your credit essentials. So, whether you are a doctor, a Chartered accountant, a trader, a manufacturer, a retailer or the one having a corporate entity, you can avail a flexi business loan based on your profile. 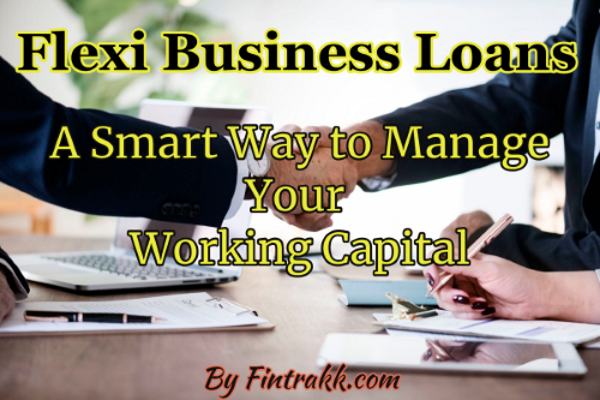 The next time you think to establish a new business or scale up the one that you already have or you wish to effectively manage your working capital demands, flexi loan is there for you. Flexi loans provide you the much needed boost to effectively grow your business and take it to a bigger level. So, why to face the cash crunch when you have such wonderful a loan facility at your disposal. Think deeply and act wisely! If you are a salaried person, you may like to have a look at: Personal Loans for Salaried Individuals: Are you eligible? What are your views on this novel way of getting access to quicker loans? Have you applied for a Flexi business loan to manage your working capital? Are you planning to avail a business loan at low interest rates? If yes, you can surely consider to avail a flexi loan for managing the day to day financial needs of your business.